Adjustable Beds: Finding One to Fit Your Needs – Rolling Without Limits: Your mobility may be limited. Your voice, boundless. Adjustable beds are here to stay! These flexible bed frames have revolutionized sleep in the 21st century. With so many options available these days, it can be hard to choose which one best fits your needs. We asked the bed experts at Transfer Master to provide some tips for finding the perfect adjustable bed for you. What is your weight and height? Do you need additional capacity or an extra long bed? What is the combined weight of people who are going to be on the bed? This will determine the required capacity of the bed. What is the size of the room? You want to make sure you have plenty of space beside the bed, especially if you are transferring from a wheelchair. How much width do you need? Twin is perfect for an individual with limited space. Full is great for an individual who wants extra space. Classic Queen works for couples with similar needs. And for couple with different needs, a Dual King (two side-by-side twins with separate controls) is ideal. What is the lowest height you need to transfer out of your wheelchair? Transfer Master offers several low profile bed frames designed specifically to support independent transfers. Remember to consider the thickness of the mattress when evaluating overall bed height. How high do you need the bed to go? For example, do you have a caretaker who would prefer to stand up straight to care for you in bed? 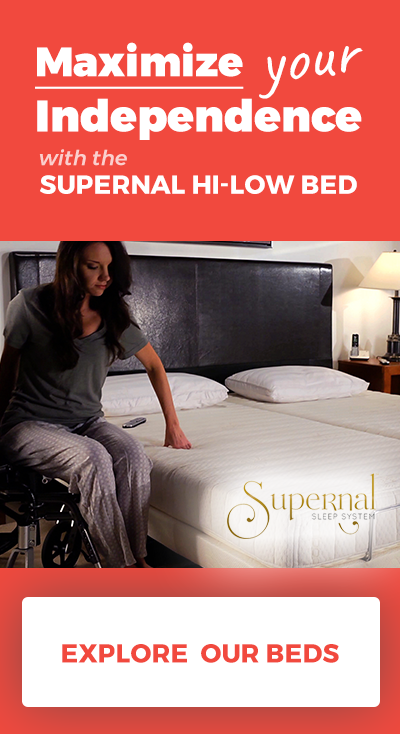 A hi-low adjustable bed can help avoid stooping and ease back pain for caregivers. Do you use a Hoyer lift? If so, you’ll want to make sure there is enough clearance under the bed to fit your lift. Trendelenburg: The user is in a supine position, lying face up, and the bed is angled so that the feet are above the head. Reverse Trendelenburg: The user is laid flat in the head-up, feet-down position. Cardiac Chair: This position provides relief to the lungs and circulation (requires a 4 or 5 function bed). Rails, to support transfers in and out of bed and to prevent falling out of bed. Wireless hand control, to adjust the bed from anywhere in the room. Pillow-tilt articulation, sometimes referred to as European style head tilt, to find the most comfortable position for your head. Battery backup, to make sure you can get to a neutral position if the power goes out. Based on our 25 years of experience, we also know it’s important that you feel good about the look of the bed. Home hospital beds have come a long way and some, like Transfer Master’s Supernal line, are designed to hide all of the electric components. This allows the bed to look like any other so you can receive guests in your bedroom without feeling self-conscious. Finally, make sure you’re buying a high-quality bed that will last for many years to come. Transfer Master adjustable beds are handcrafted for durability, safety, and excellence—and every bed is assembled and quality checked at our manufacturing facility in the heart of the USA. Make your next adjustable bed purchase an investment in craftsmanship, quality, and style. 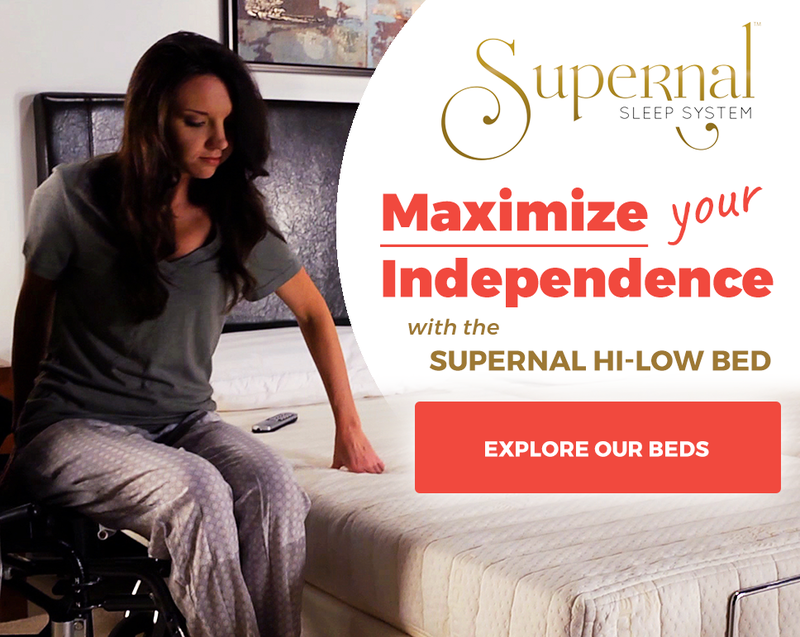 Do you have questions about adjustable beds? Ask Transfer Master’s bed experts in the comments, and we’ll get you answers!